The last graphic novel I reviewed was Brian Vaughan's Saga which was brilliant - but I mentioned that due to its confronting nature it's not one I'd feel comfortable recommending to people who are not already into comics. I do want to present a graphic novel that is more approachable as I often encounter people who love reading but vehemently insist that they'd never read a graphic novel as they are in some way a lesser literary form. I want to challenge this view as I've encountered many brilliant works that deserve equal status with quality works of prose. So here's one that is a lot easier to approach for someone not yet comfortable with graphic formats. 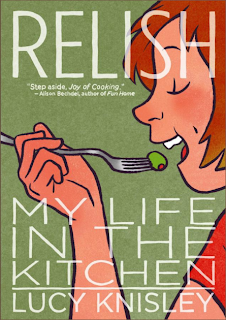 Relish is an autobiographical work with a number of recipes that tie in with the stories presented as comics. I was already aware of some of Lucy Knisley's other work, particularly the webcomic Stop Paying Attention which is another autobiographical work and well worth the time to read. 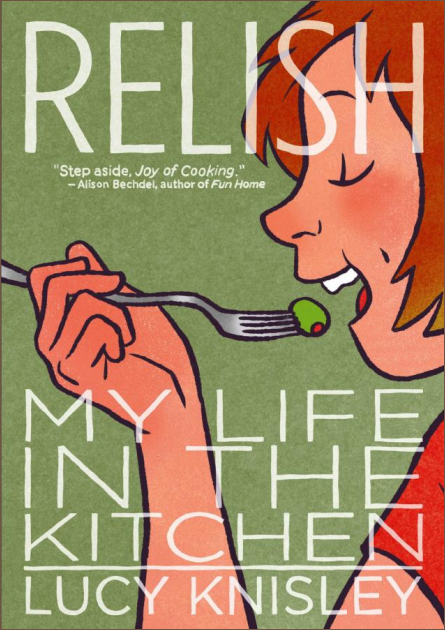 The stories are fun and honest and now I want to cook every single one of the recipes. So far I've tried two - the first is a recipe for chai which was remarkably simple and seriously delicious. I'll be making that one quite a lot in the cold weather we're having now! The other I tried was Carbonara - the hardest part was not eating the fried garlic and white wine infused pancetta before it was time to add it to the rest of the ingredients. If you do make it it's definitely worth the search to find pancetta instead of bacon. The recipe presentation is clear with illustrations making the steps easy to follow and every one of them looks delicious. Even if you are not normally a reader of graphic novels, if you enjoy interesting memoirs and are looking for a recipe to try why not give this a go?